WHAT’S IN THE BOXThe following are the items in your box this coming week. Some items and quantities may vary depending on your harvest day. The photo is the full share on Saturday. HAPPY NEW YEAR! We send you our best wishes for a enjoyable and peaceful 2013 and thank you for your support of our farm. NOTES ON THE SHARE Basil - Small bunch in every box. Bok Choy – Medium size bok choy 'White Stem' and 'Red'. Capsicum - 'Purple Beauty', 'Emerald Giant' and 'Corno di Toro'. Carrots – Mixture of ‘Scarlett Nantes’, ‘Cosmic Purple’ and ‘Red Core Chatenay’. The carrots are growing into longer medium size carrots. Cauliflower/ Broccoli / Cabbage – Some boxes are receiving cauliflower, some broccoli and some cabbage depending on the harvest. Chilli - 'Hungarian Hot Wax', 'Pimiento de Padron' and 'Cayenne Long Thin'. We leave the chillies loose but the 'Padrons' we put into a bag and you get enough to make a tapas dish. These delightful "sometimes hot, sometimes not peppers" are a great starter. Coriander - Small bunch in every box. Cucumbers – We are growing long cucumbers and short cucumbers. The shorter are sweeter and apparently "burpless". This week each box should receive two/three cucumbers. Dill - Small bunch in every box. Garlic – One clove in every box. We have begun to clean the garlic and sort out our seed garlic for next year. 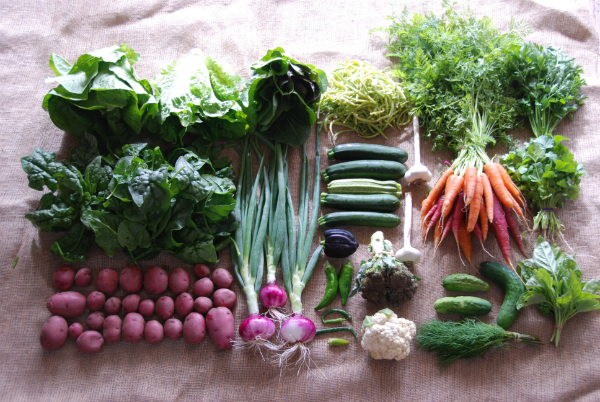 The remainder of the harvest will be divided into the summer and autumn share boxes. Bush Beans – The harvest has started with the varieties this week include 'Cherokee Wax' a yellow bush bean, 'Simba' and 'Strike' which are both green. Lettuce – 'Buttercrunch' and 'Parris Island Cos' (in the full share). Onions - The onions this week are 'Red Burgundy'. Slightly sweet and very beautiful. Parsley – 'Italian Plain Leaf' Potatoes – The past week we have been moving through the 'Cranberry Red' variety and into the 'Desiree'. Both are red skin. The cranberry red remains red even when cooked. Shelling Peas – 'Green Feast' is the variety. The natural sugar in peas begins turning to starch immediately after picking. So try and eat your peas in the first days of receiving your box. We love the shelling process - sitting with a friend, your children and a cup of tea and sharing the day while you prepare the meal. These are so sweet they barely need cooking (steam for three minutes) or just put them raw into your salad...if they even make it past the table. The peas have started to succumb to powdery mildew which is very normal. They do not like the hot, humid conditions that summer brings. We will attempt to continue picking the peas that remain until the mildew damages the actual peas. It is just come onto the foliage of the last pea planting for this season. Spinach – English spinach 'Long Standing Bloomsdale' or a bunching variety 'Sharaku'. Squash – The variety is 'Jaune Et Verte' but in Vermont we just called them Patty Pans. These are delightful summer squash if picked when young. We have added a recipe for them and will get them into everyone's boxes throughout the season. They are small, round with scallop edges and a light green colour. Really lovely baked! Zucchini– Zucchini this week includes 'Nero di Milano' and 'Romanesco' - two/three in every box. NOTES ON THE SHARES We are moving between crops and between plantings of the same crops. We think there will be a variation between the Saturday, Tuesday and Thursdays boxes. As we assemble the boxes from the harvest, we try to ensure that within each box there are at least 10 items (not including herbs) in half share or full share quantities. This means that someone may receive peas while someone else might receive beans. We do record what everyone receives to try and ensure everyone gets everything. Items such as 'Pimiento de Padrons' or the 'Jaune Et Verte' squash we rotate through the boxes so that everyone will get to try them. NOTES ON WHAT'S GROWING The cherry tomatoes have started to change colour and will be making it into the boxes soon. The corn is beginning to flower with ears just forming. We expected to have the celery by now but it is a really long season crop, loving water and compost. We noticed last year that the longer it stays in the ground, the taller it becomes and also the juicier. It is still very stringy right now but we will keep trying it every week. We will begin harvesting yellow beans this week and have moved into another planting of green one. The purple climbing beans are about 2cm long and growing. We are entering into what we hope will be a nice long season of beans! RECIPE SUGGESTIONS As this is the season for entertaining, we tried to find a variety of finger food recipes. Vegetable Pakoras is a recipe donation from Paul Dempsey. Paul and Lisa Dempsey are the faces behind Big Blue Backyard, a local, secluded, award winning, ocean beach hideaway for couples. Designed to blend into the natural environment, this unique retreat sits perfectly between the dunes abutting the National Park at wild and often deserted St Andrews Beach. Paul is a wonderfully diverse chef who draws his inspiration from the ingredients presented to him each week. The meals served to guests are unique, exquisite and seasonal with ingredients sourced locally.